Quality Microfiber Towels Are Critical For A Proper Shine! The market for microfiber towel products, especially automotive towels, is fierce. With the demand for microfiber increasing in both retail and professional channels, dozens of small factories in Korea and China have sprung up, seemingly over night, to compete solely on cost. These factories are flooding the American market with low-cost, inferior products. 1. Most inexpensive towels use microfiber thread that is not split. Quality microfiber towels absorb 7-8 times their weight in water because the fibers are split, creating more surface area. The cheap towels are not split because the equipment necessary to produce micro-replication splitting is very expensive. 2.The Microfiber threads on cheap towels are larger. Quality microfiber strands are .01 to .02 denser. That�s about the same as the polyester thread used in bath towels for increased durability. The finer the thread, the softer the towel, generally. Cobra Microfiber Towels have threads 100 times smaller than a human hair! 3. Some of the inexpensive towels may also be 100% polyester or have low polyamide content. As a result, the towels will have little absorbency capability. Look for a 70/30, 75/25, or 80/20 blend, like Cobra Microfiber Towels. Before you buy a bundle of microfiber towels at a �bargain� price, look, feel and read the label. 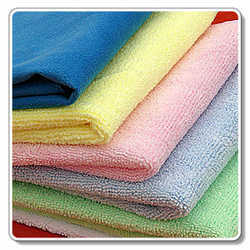 Some inexpensive microfiber detailing towels are thin and have a short nap. These cloths are ok for utility towels but not for buffing paint. 1. Towel density is important. Density is a measure of fibers per square inch of fabric. The range for quality microfiber is 90,000 to 225,000 fibers per square inch. Generally speaking, the higher the fiber count the better the towel will absorb water and clean. 2. The ratio of the polyester and polyamide blend is important. While 80% polyester and 20% polyamide is great for detailing, a 70/30 blend will absorb water faster. As polyamide is much more expensive than polyester, you can expect to pay more for a 70/30 blend. 3. Make sure you look at the weave and fabric thickness (plushness) of the towel. Depending on the specific task the cloth is designed to perform, the fiber ends may be hooked (for cleaning), feathered (for polishing), or in a waffle-weave pattern (for glass and drying). 4. Use Dedicated Glass Towels. The Waffle Weave Microfiber Glass Towel was engineered for cleaning glass. Tiny spokes in the individual fibers, too microscopic to detect with the naked eye, lift and trap dirt and moisture, while gently buffing the surface to a shine. Microfiber is designed to never shed lint. Keep your glass towels apart from the rest of your microfiber towels, and wash them separately from all other microfiber towels as cross-contamination from the residue of other towels can cause streaking when cleaning windows. 5. We all know the saying; you get what you pay for. Microfiber is no different. ; Quality construction is not always obvious, so let me share some observations. The biggest complaint with automotive microfiber is that towels with cheap edging scratch your paint. There are two possible reasons. First, the factory uses a hot wire system to cut their towels. ; If not properly adjusted, or if a cheap machine is used, the hot wire will melt the fabric. When polyester and nylon melt, they turn into hard plastic. The second complaint is that the towel creates excessive lint. Microfiber lint is caused by towels with a high pile or a broad weave using a fiber split that�s inappropriate. The high pile or loose weave allow the fibers to break off, creating lint. The same split fiber used in a towel with a higher fabric density will lint less or not at all. Don�t assume that a towel that does not lint is a high quality towel. The cheapest towels don�t lint because they do not have split fibers. Trust Cobra to for soft, plush, lint-free detailing and buffing towels.